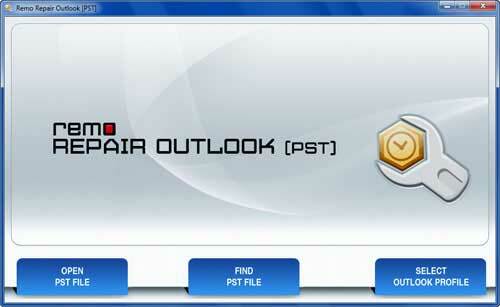 Remo Repair Outlook (PST) tool is to repair corrupt / damaged PST file. Using this Remo PST Repair tool you can recover all your email messages, folders, contacts, appointments, meeting requests, tasks, calendar, task requests, journals and notes. Repairs PST files created on Outlook 2000, 2003, 2007 & 2010. It will generate a new PST file in Outlook 2003-2010 format which can be easily imported back in Microsoft Outlook. - Recovers deleted / lost emails, contacts, calendar, notes etc. - Outlook style browser view to preview recovered emails. Qweas is providing links to Remo Outlook Repair 3.0.0.5 as a courtesy, and makes no representations regarding Remo Outlook Repair or any other applications or any information related thereto. Any questions, complaints or claims regarding this application Remo Outlook Repair 3.0.0.5 must be directed to the appropriate software vendor. You may click the publisher link of Remo Outlook Repair on the top of this page to get more details about the vendor.